Fernox TF1 Total Filter TF1 from PlumbNation is a magnetic central heating Fernox TF1 filter designed by Fernox to magnetically remove iron oxide contamination from your central heating system. 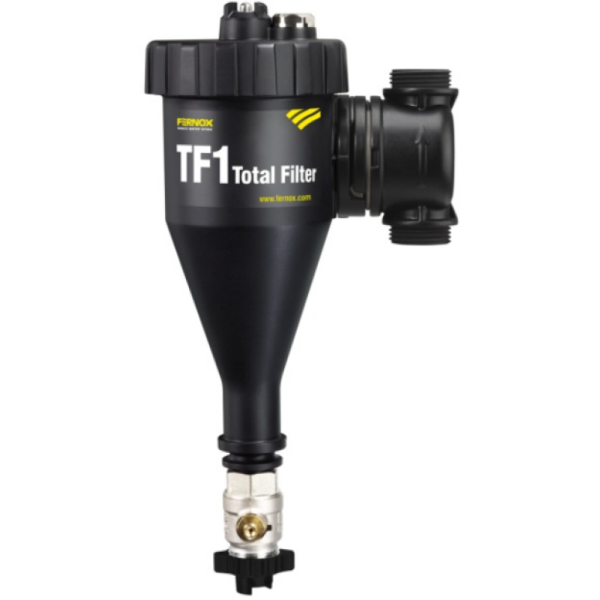 Fernox TF1 Total Filter is a revolutionary in-line filter, which combones hydrocyclonic action with specially designed magnet assemblies, to remove and contain both magnetic and non-magnetic contaminants within closed loop heating systems. The Fernox Total Filter TF1 Magnetic Filter is available in 2 sizes, 22mm and 28mm depending on your pipework. The Fernox TF1 is then connected directly to the pipework using the valve fittings provided. The Fernox TF1 Magnetic Filter can also be installed horizontally or vertically and has been conveniently designed to be installed flust to wall in existing pipework.